"I discovered a one-room cabin on a hill in Los Altos about 45 minutes away from San Francisco." In my Kind Over Matter article last month (“Why You Need – and Deserve – a Personal Retreat” – 2/21/18) I shared some of the reasons it is so important to have deliberate quiet, introspective time in our lives. If you missed that article, you can catch it here! As promised, this month I want to talk about the nitty-gritty of a personal retreat: where to go, what to bring, what to do! The thing about personal retreats is that they are just that – personal. There is no one-size-fits-all. Where you go and what you do depends on what you need right now and what will bring out the best, most happy you. That said, I can give some pointers and ask a few questions that will help you come up with your own perfect plan. I am so excited that you are considering doing this for yourself. Think of the old cliché about “putting on your own oxygen mask first before helping others.” We all want to love and serve the best we can, but we have to take care of ourselves first. We have to come from a healthy, strong, clear place. A personal retreat will ground and nourish you so that you are renewed and clear at work and with your loved ones. Don’t do that. Don’t let yourself get talked out of this. You can find 24 hours when someone else can be in charge of the kids, the work, the house, the parties, the everything. Of course you don’t want to miss any big events at work or home. But right now I want you to promise me that you will find a day. Even if it is six months from now, that’s okay. When you find that day on the calendar I want you to put a big heart on that day in a colorful marker and write ME! This is a day for you. Keep that appointment as if it is an appointment with your colorist or hairdresser and he’s always booked months ahead of time! You know what I mean? That sacred. Where you choose to take yourself depends on a few things: your budget, how much driving (or public transportation) you want to do and your lifestyle. 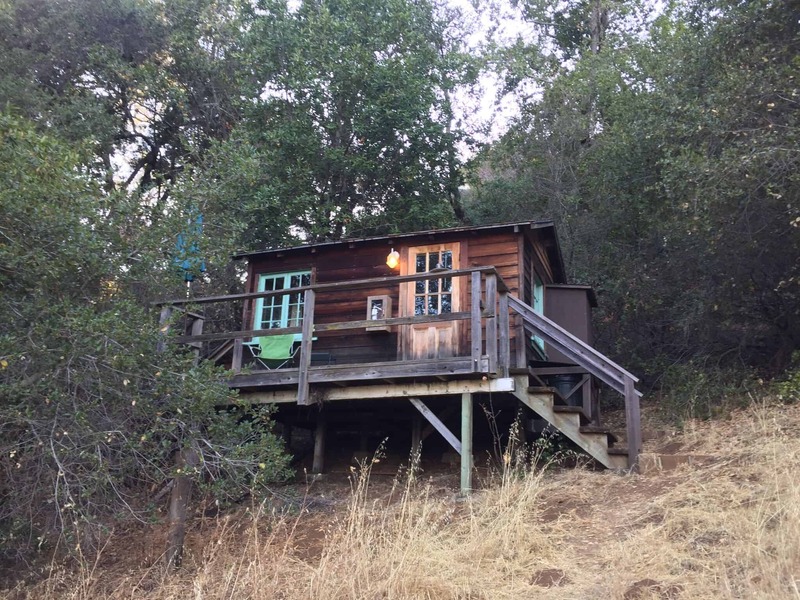 I discovered a one-room cabin on a hill in Los Altos about 45 minutes away from San Francisco that they rent out for $65/night. There’s electricity, which I like for my laptop, but there is no Internet or cell phone service. I can get there in less than an hour, it doesn’t cost an arm and a leg and it feels remote once I’m there. I like that there is a small fridge, a toaster, a teapot and most importantly – a French press coffee maker. The coffee mugs are solid and the plates are pretty. There’s a wide view of the sky and the hills which feels like it opens me up to possibility as soon as I sit on the deck and take that first deep breath. It is perfect for me. I go to that same cabin four times a year. The day I return from each retreat I schedule the next one in three months. That little cabin has become a lifeline for me! You just want to find a place that feels really comfy and private. And most of all, someplace that feels like it brings out the best in you. You see that last item on the list? “Push-the-envelope” clothes? You know what that means? That means bring the beautiful cashmere sweater and colorful scarf that make you feel like a painter in the Riviera. Bring the necklace that feels like Hollywood. Bring the hat that you are waiting for the “right time” to wear. Bring clothes that you bought because they feel like the you who is inside – dying to come out and play. Let yourself be exactly who you know you are, even if it is just for 24 hours. This is a day just for you. No one’s watching. Anything that feels limiting or connected to old beliefs about yourself. Okay! You have a date, you know where you are going, you have everything you need to take. But what the heck do you do on your personal retreat? This is where you really need to trust your own wisdom. Let yourself daydream about your retreat. Do you need time to envision the future and tap into your goals? Do you want to paint, write or sculpt? Do you need time to do absolutely nothing and not be on a schedule? Do you want to read good books? Do you want to do yoga, dance or meditate? Do you want to write letters to people you love or your younger self? For me, that scheduling part is key. It ensures that my retreat accomplishes what I set out to do. I’m generous in giving myself relaxation time, but if it is a project-based or goal-setting based retreat I make sure those get priority on the schedule. I trust you on this. You should, too. Maybe it will feel a little awkward, uncertain or even uncomfortable the first time you have a retreat. But I can tell you from my own experience, every time I’ve done this it has just gotten better and better. Why? I get to know myself better. I know what works for me. I know what to plan. I have my rituals. I show up fully for myself. You got this. Now … get outta here! P.S. I got so excited when I was writing this article that I turned on my recorder and made a five-minute audio to cheer you on. Listen here!